This picture was taken at Pismo Beach around 1995. 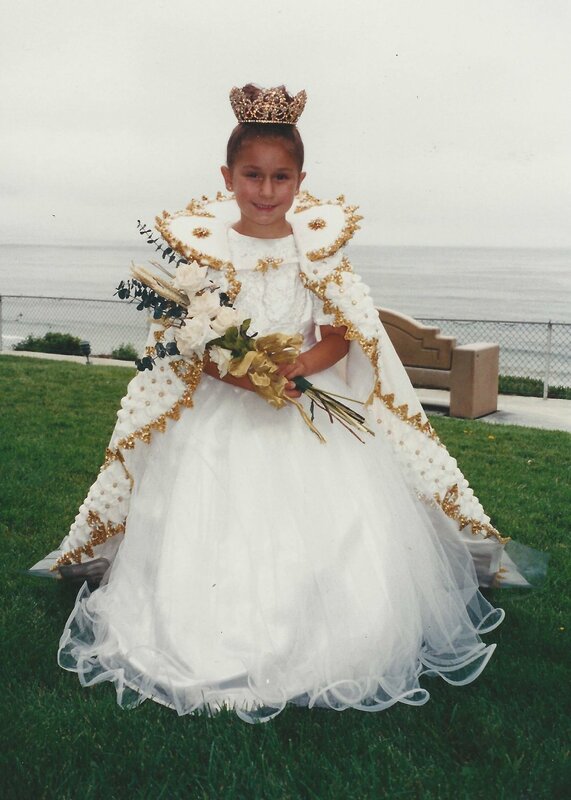 At age 6, Sierra was the little queen for Joe and Mary Estacio and the Turlock Pentecost Association. We loved going to the Festas and met many wonderful, life-long friends and made lasting memories. This Festa was one of our favorites because of the beautiful location, delightful weather and the BBQs on the beach. Sierra was a trooper. She didn't complain (much) about the long distances, hot weather, pulled hair or heavy dress. She took her responsibility seriously and made the best of it each and every weekend. When we first got married, I used to beg Leroy to take me to the Festas. I loved all of the ceremony and tradition. Little did I know that we’d get so involved that he would eventually serve as President of TPA and Sierra would march as a queen for three different presidents; Joe Estacio, Leroy and finally for her grandfather at Our Lady of Miracles. It was a huge time commitment but I don’t regret the choice to participate.